It is said that the average person will change professions several times in his life. There may be many reasons for change, but it is sad when one’s own character prevents him from charting a course and sticking to it. Antoine Doinel, the hero of The 400 Blows, has not quite grown up. Let me rephrase that: Antoine and his environment are changing at different speeds. When once Antoine’s insolence was charming, as an adult it is clear he may never find his way. But is that as sad as I think? In between his gigs as a soldier, a concierge, a detective, a stock boy in a shoe store and a television repair man (I think I’ve got them all) there is always love, sweet, impulsive love. In this regard Antoine will never age. François Truffaut’s major preoccupation was romantic longing. We see it in every one of his pictures: Two English Girls and A Woman Next Door are both about obsession; in The Bride Wore Black love manifests itself as revenge for a lost love; Fahrenheit 451 details the love of books, and The 400 Blows was the love of childhood, of cinema, of friendship and liberty, all also themes in Truffaut’s work. In Stolen Kisses his themes clash in ways the director might never had hoped for. In the summer of ‘68, France experienced a revolution begun by students fed up with poor conditions in state-run universities. Riots and demonstrations (often one and the same) shut down industries; unions joined in the students’ struggles, and when the government appointed a new director for The Cinematheque Francais, ousting founder Henri Langlois, filmmakers joined in. Langlois was one of the two most important people in Truffaut’s upbringing, along with Andre Bazin, film theorist and co-founder of Cashiers du cinema, the underground film magazine that Truffaut wrote for as a critic. Langlois, apart from single handedly preserving films that otherwise would no longer exist, gave Truffaut the opportunity to see films that no longer circulated in popular movie houses, and through Langlois, Truffaut and the entire Cashiers crowd gained their excessive love and knowledge of the history of their craft. Truffaut was so upset over Henri Langlois’ firing that he formed the Cinema Defense Foundation, an organization determined to give control of the Cinematheque back to its founder. The director supposedly made phone calls for donations in between takes on the set of Stolen Kisses. For all of it though the film is mostly apolitical. If one does not research the topic it wouldn’t make a lick of difference when watching the film. Sure Truffaut opens the film with a shot unrelated to the story, the sad image of the French Cinematheque closed to the public (and he also dedicates the film to Langlois), but he does not address any riots, in fact completely ignores the plight of the students, a cause he championed in his private life. The reason for this is simple: he was not a political filmmaker, though it makes the words of Jean-Luc Godard at the 1968 Cannes Festival both ironic and searing, accusing himself and all filmmakers presenting that year that they were behind the times since no film detailed contemporary France, the struggle between the students and the extreme right-wing government. Is this a fault of Truffaut’s or merely something that proves him as a true auteur? I’m inclined towards the latter since I myself detest politics in films. Truffaut was more interested in the arts and humanity, in love and romance and friendship. Life should not stop because of political upheaval, instead this upheaval is a part of our lives, and we should live and rally against the opposition. In this regard, Stolen Kisses as a movie is not one of Truffaut’s best pictures. There’s nothing wrong with it per se, but it is too improvisational; that is there exists a free-wielding structure that can be great in another movie but here it left me... not bored but ambivalent towards the screen. I hope that makes sense. Watching it in action the film moves as briskly as anything Truffaut made and it’s filled with beautiful, touching moments, but it lacked the earnestness of The 400 Blows, the film that gave us Antoine Doinel. Maybe I shouldn’t be comparing the two films. They are quite different. Here Antoine is becoming a man. He (like Truffaut did) receives a dishonorable discharge after volunteering for the service. The man dismissing him wonders why he volunteered; speculates it was to impress a woman, but we soon learn the truth: Antoine read a book about the service and his experiences in the army merely did not match it. This is the problem with Antoine as he gets older. I may be biased since personally I’m not prone to risky, hasty decisions, but the older he gets the less “cute” his misadventures seem. He doesn’t seem to understand that the years will go by whether or not his romantic fantasies are indulged, and in trying to live as he thinks he should he is forgetting to live. But that is not right—this is my own attitude talking. Antoine lives an exciting, experience-laden life. His many professions allow him to sample a whole universe set up by tradition and necessity. He is constantly working, obviously, making enough money to keep an apartment (and certainly doing better than an old school friend he meets on the streets who rummages through trash—perhaps a dig at the government for failing its youth). Jean-Pierre Léaud reprises the famous role. This man was a conduit of the New Wave. I get the feeling that we, the audience, have never known the true Léaud. Truffaut used him to express his own flighty moods and Godard used him as an anarchic symbol, another extension of someone else, and through it all Léaud let himself be shaped. He is a true chameleon, a divisive actor whose improvisation style never seems to be wrong. He always fits his films, even when he stands out. I can admit though to finding him pretentious sometimes, though seldom with Truffaut. Throughout the Doinel films he doesn’t shape an arch for the character. He simply performs the role as Truffaut wrote it, experiencing life as Antoine has in Truffaut’s script. This relaxed attitude towards his craft (and least that’s how it appears to me) is fascinating, and proves that movie acting is about having spirit and knowing lines, and very little complexity. 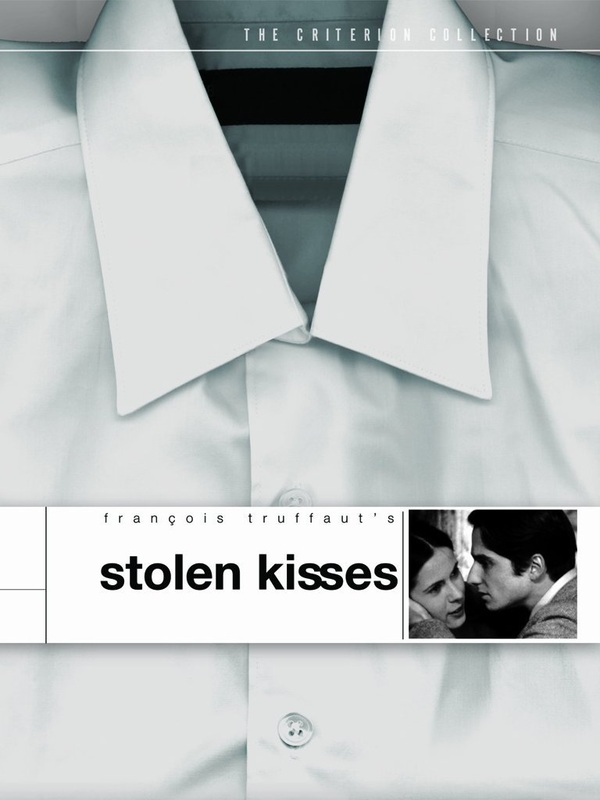 Stolen Kisses is Léaud and Truffaut’s lighthearted take on the growing adventures of Antoine Doinel. He is no longer the lost kid we first knew. He is a young man, making his way in the world and constantly lost in it through a free-wielding spirit in search of love. I along with millions of people since 1959 have adopted Antoine as a friend, a son, a spiritual partner, and care about him deeply. I guess ultimately I found Stolen Kisses somewhat melancholic; that Antoine cannot keep a job and moves with the wind does not speak well for his future endeavors.